Everyone would welcome a holistic, reliable, and relatively straightforward way to enhance and maintain soil health on many farms, regardless of their size, product, management approach (conventional, organic) and other characteristics. Some farmers and consultants have long said that Soil Balancing (SB) is that way, a means to loosen and enliven soil, provide essential nutrients, limit weed problems, and enhance crop yield and quality. However, university researchers have largely been unable to support that overall claim or recommend Soil Balancing as the guiding philosophy when making soil, fertility, weed, and certain crop management decisions. With USDA support and the help of many growers, consultants, and others in the industry, an OSU team has been taking another look at the situation, possibly the most comprehensive, collaborative, and long-running evaluation to date. As outlined in three previous VegNet articles and other references on SB, the philosophy calls for achieving an optimum ratio of calcium, magnesium, and potassium in the soil. This may require large amounts of limestone and/or gypsum and multiple years to “move the needle” on soil chemistry, physics, and biology (and their follow-on effects on weeds and crops) in a positive direction. Regardless, some see the payoff as significant. Importantly, evaluating the economics of Soil Balancing is one component of the OSU-led effort, which began in 2015 and is set to provide valuable new insights. Look for summaries in upcoming publications, programs, and other resources. 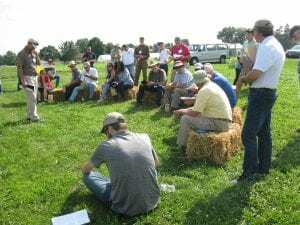 A Stakeholder Advisory Committee including farmers, consultants, and university professionals from Ohio and other states has guided the OSU team throughout its work, helping to design experiments and interpret and share findings. Committee members and others visited project research plots on farms near Wooster and at the OARDC and discussed project emerging project findings on August 9 and 10. In this picture, the group discusses the status of plots containing butternut squash, edamame soybean, and dwarf popcorn. For more information, see https://u.osu.edu/vegprolab/research-areas/soil-balancing/ or http://organicfarmingresearchnetwork.org.ohio-state.edu/network_activities/soil_balancing/ or contact Matt Kleinhenz (330.263.3810; kleinhenz.1@osu.edu). Posted by mattk at 11:43pm Posted in Uncategorized. Bookmark the permalink.